Have you ever thought about loosing weight just in a small square device? Withings Wireless Smart Scale is the actual answer and this is the best companion ever for you who try to lose weight and get fit. We know that all people want it so much. The technology of this device is very incredible, no wonder it is popular until now. Withings has released WS-30 first before produced the new one with extra features WS-50. But, they are still being compared. Why? Check this article below. Withings Wireless Scale WS-30 is kind of WiFi bathroom scale hands-on. The size are 11.8 inches on each side and 1.3 inches deep, 4,4 pounds of weight and it runs on 4 AAA batteries. The casing are made of plastic and glass surface materials (easy to be cleaned). It has scale which hold 4 sensors and four sensors and a patent-pending body position detector for accuracy, measures both weight and body mass index (BMI), and has Bluetooth 4.0 and Wi-Fi. You can install anykinds of applications like BodyMedia Fit, Fitbit, RunKeeper, Runtastic, Jawbone Up, Walgreens apps, and even the Samsung SmartTV. The applications will be connected by Bluetooth whatever your handphone is. All you have to do are pairing the scale to your phone, downloading the Withings app, following the instructions, and starting it. There are two buttons on the scale, One controls the Bluetooth functions, and the other allows you to toggle through display options. By the Wellness levels, you can collect data on for example weight, activity, sleep, and heart. The main drawback is that the scale itself can measure only a few metrics—weight and BMI info. 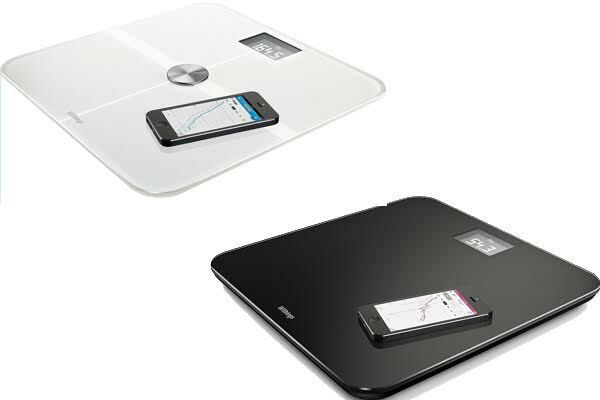 Withings WS-50 Smart Body Analyzer is featured with Wi-Fi connection that can connect wirelessly to an application on your smartphone so, you must install Withings app in Android or iOS device. The design in very beautiful with shiny looks, make your bathroom is more luxury. On the smart body analyzer, you can read all your weight, body fat percentage (enhanced BMI), muscles, heart rate, and air quality in our body. To get the best from your Smart Body Analyzer, use it at the same time every day, and avoid abnormal eating, drinking or exercise immediately before and the heart rate and room air quality metrics would have been great additions if they were in any way accurate. How about the body measurement? All hope is about CO2 and heart rate readings and say the same. The official website of Withings display is customizable which means you can add in measurements and click and drag panels around the screen. Based on the reason behind the producing of Withings WS-50, they want to add extra features on the WS-50 so that if someone purchased it, it is worth it to buy especially if your goal is loosing weight. How about WS-30? Still, it is worth it to buy too. But, for you who start to have it, it would be better if you buy WS-50.